American composer of Rhapsody in Blue. 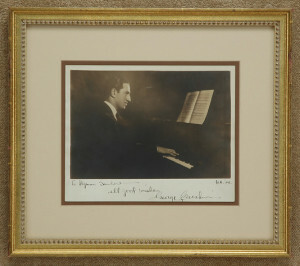 Sepia-tone Photograph of Gershwin in profile, playing the piano, Signed, Inscribed and Dated on the lower margin, “To Hyman Sandow – All good wishes / George Gershwin / Feb. ’28”. A slight defect in the photographic surface, in the center upper portion, not affecting the image of the composer or his Signature or Inscription. Framed in sand, cocoa and beaded gilt. Framed measurements: 16 1/2 inches wide by 14 1/2 inches high.